At the national level, however, big-time sports is big business, with billions of dollars at stake, and Americans tend to be cynical about the whole show. In this world, Mr. Tebow's frequent professions of faith can come across as a discordant note, equal parts over-earnestness and naïveté. It's hard to resist the thought that, eventually, a darker reality will show through. Mr. Tebow may indeed turn out to be a hypocrite, like other high-profile Christians in recent memory. Some of us might even want that to happen, because moral failure is something we understand. We know how to deal with disappointed expectations, to turn our songs of praise into condemnation. What we are far less sure how to do is to take seriously a public figure's seemingly admirable character and professions of higher purpose. We don't know how to trust goodness. And who can blame us? We don't want to be fooled again. Patton Dodd wrote the article. The WSJ editors describe him as follows: "Mr. Dodd is the managing editor of the website Patheos [worth looking at] and a former senior editor at Beliefnet. 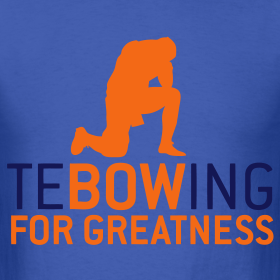 This article is adapted from his e-book, "The Tebow Mystique: The Faith and Fans of Football's Most Polarizing Player."